After seeing heart-tipped nails I got it in my mind that I could take things a step further and go after one of my favorite logos, Comme des Garcons Play. I loved how accurately these turned out and it was surprisingly fun to have a ton of little eyeballs staring at me all day. 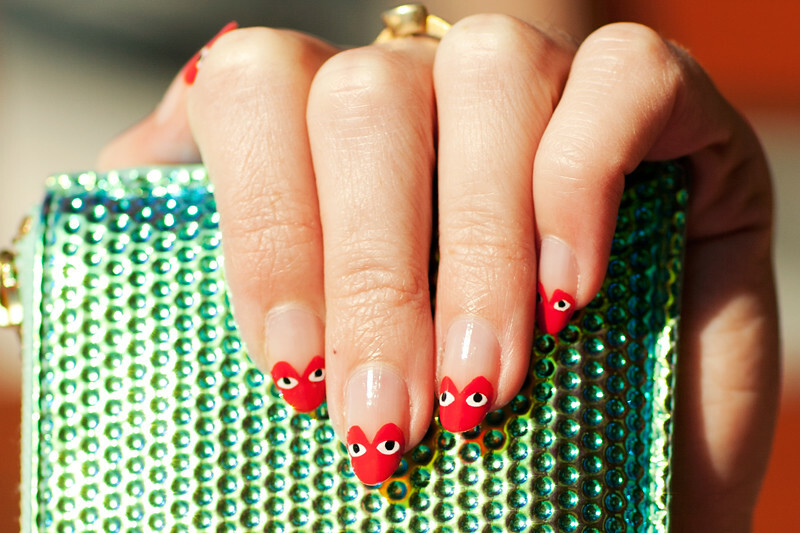 These are very DIY-able, but I do recommend starting out with slightly rounded/pointed nails to get the heart shape. In the pics I'm holding my new Comme des Garcons jewel wallet and wearing my new favorite item, my Nike Destroyrer jacket. Haven't seen such cute nails before. omg, YESS! these are beautiful!!! I'm obsessed now and forever! Those nails are so much fun! What a fabulous idea!! They are Gorg!! Love them both!! this is so crazy awesome!! such a simple and extremely coold idea!!! am gonna totally DIY this!!! Absolute gorgeousness! They are incredibly cute.